Krissy looks way better, even his eye is improving fast so hopefully this was all trauma related. I took this photo after I did his eye treatment. Thank you for so many messages of concern for him, he has a huge backing that will have to help! Super close up portrait. Hadn't realised the shape of the pupil was so unusual. Pleased he's getting better. A cute capture, glad he’s improving. Yesssss! Way to go Krissy! Such good news - now let's keep everything crossed for a negative Chlamydia result. Question: as they are quite combative when you approach/touch them... how do you manage to give them the treatment they need? He looks so much better! What does the fur on his face feel like? I hope he gets a clean bill of health. Wow...What a great close up of his cute face...His eye looks like its recovering nicely. What a great shot - love the focus on Krissy's eyes. So glad he is feeling better. Good news, so happy for him. Wonderful! Her eye look fantastic too! So happy. Fav. So good there is taking care of this sweety. Was going to say bright eyed and bushy tailed but they don't have them do they! Firstly approaching from behind is important, yeah I can't see the eye, but you can imagine trying to put your hand towards all the sharp bits at the front! All this is done quite fast and almost in a single movement when you have a little spitfire like Krissy. And of course it is all done with them in a log perch surrounded by leaves, so it all adds to the excitement. However, it is important to just be fast, firm and quiet. I don't speak to him at all, just go in quietly and do the job. 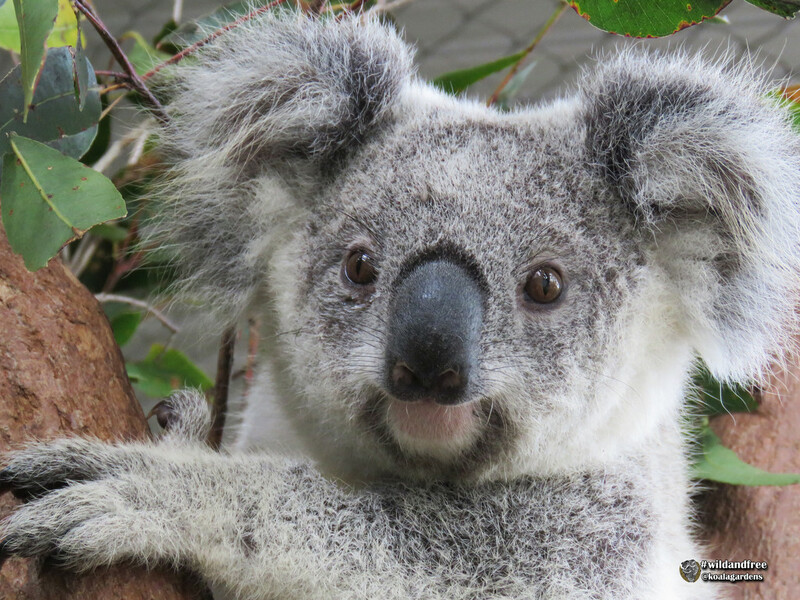 This helps reduce stress enormously as koalas do not socialise, so they don't want someone fussing around them and looking at them directly and talking all the time. It also helps keep them wild as they are barely handled for the treatment to be done. @kchuk their fur is very soft, and it is incredibly thick and lush. This is why they were killed in their millions - the pelts were highly prized and worth a lot of money because of the softness, but also the water proof nature of the coat too. Krissy does look better, loved the way you explained how to get the ointment in his eye! She looks wonderful !A picture ! A wonderful portrait. It's great to watch how your health gets better. It’s wonderful to see Krissy looking so alert and healthy. A great shot. Fav. Oh and thank you for all the extra information about how you go about treating him. Sounds like he is very well looked after. Your patience + concern + sangfroid + experienced handling = Effective acceptance by Krissy + healing. Chapeau!